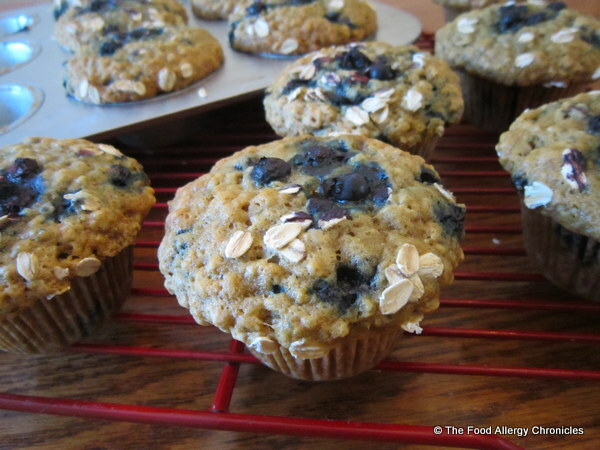 Posted on May 6, 2013 by Susan H.
Todays Allergy Friendly Muffin Monday is an attempt to entice my boys to try one of my healthier muffins, scaled down…whole-wheat/bran muffins filled with fibre do not tempt them. Hence, this weeks muffin is a reconfiguration of last Monday’s Dairy, Egg, Soy and Peanut/Tree Nut Free Oatmeal Lemon Raspberry Mini Muffins. Click here for the link. Andy loved them…Matthew liked them…I preferred the heartier version of the whole-wheat flour and oatmeal combo…MIchael has yet to try them…it’s the oats that is putting him off. It can be such a hard balance…trying to please each of their individual palates, yet, at the same time, creating a healthy snack. 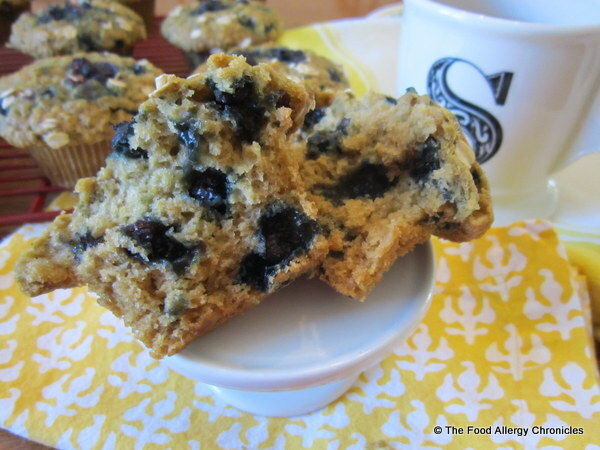 I kept the ingredients simple…unbleached all-purpose flour, quick oats, brown sugar, rice milk, egg replacement…to highlight the star of these muffins…frozen wild blueberries. 1 1/4 cups Natur-a Rice Beverage or Natur-a Soy Beverage mixed with 1 tbsp. white vinegar…let rest while measuring ingredients. Gently stir in the frozen blueberries into the dry ingredients. Add wet ingredients to dry and continue to gently stir until just combined. 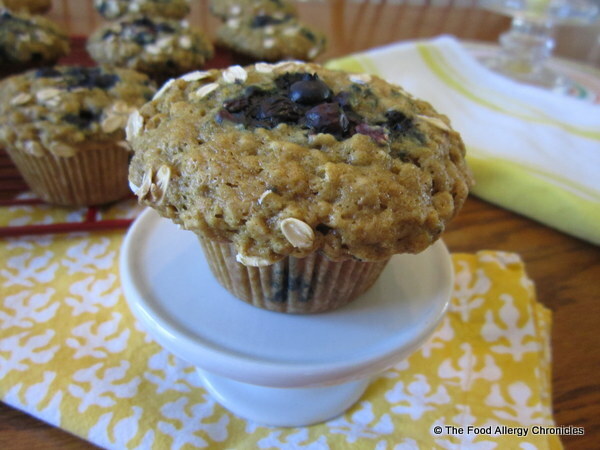 Top with a sprinkling of whole oats and 3 frozen blueberries on top of each muffin. Bake at 375 F for 20-25 minutes or until the tops are golden on the edges. Let cool on cooling rack for 10 minutes before turning out to continue to cool. Just look at all those yummy wild blueberries! For a lemon blueberry version…add 1 tbsp. of lemon zest to the dry ingredients. For a cinnamon blueberry version…add 1 tsp of cinnamon to the dry ingredients. For a gluten-free version…replace all-purpose flour with a gluten-free flour blend and use gluten-free oats. How do you manage to create healthy allergen friendly options to please your individual family members? This entry was posted in allergies, baking, dairy free, egg free, muffins, oats, peanut/tree nut free, sesame free, soy free and tagged Canadian Living magazine, Dairy Egg Soy and Peanut/Tree Nut Free Oatmeal Blueberry Muffins, Natur-a Rice Beverage, Natur-a Soy Beverage by Susan H.. Bookmark the permalink. Have you tried the silicone baking cups for muffins? I am thinking about getting a set and walking away from the paper cups. I love my Silpat silicone baking sheets so much that I have 4; hoping the muffin sets make me as happy. I meant to get them to you yesterday…but every time I looked out your truck was not there. Glad the boys caught you this morning. 🙂 Enjoy!